A few weeks ago I had lunch with my friend Jenn who was kind enough to bring me some of the Baked brownies she had just made. Of course, as soon as I got home I ate one and stuck the rest in the freezer where they proceeded to stay for oh, two days. These brownies are so good, even straight out of the freezer! This meant I needed to dust off my copy of the Baked cookbook that has been sitting on a shelf collecting dust. What better time to try a new recipe than when it’s 80 degrees outside? Yeah, that’s how good these brownies are. Mine were slightly underbaked so they were chewy and fudgy, but I’m not complaining! Recipe from Baked: New Frontiers in Baking. I’ve heard about Baked. Yum! 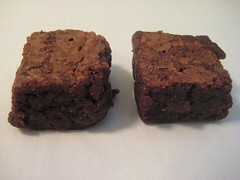 I thought these Baked brownies were amazing, too!! I just love how fudgy they are, with that slight crust. Amazing. The book was so worth the investment. Your brownies look amazing. Sorry that I’ve been an absent commenter; I just finished up my law school exams and am finally getting around to my google reader. This treat looks fabulous! yummy! sounds like a fantastic recipe.